The Romans introduced a wide variety of new food products to Norfolk from all areas of their Empire. What they could not catch, rear or cultivate here they imported from the continent. Olive oil, wine and fish sauces were all transported in strong pottery vessels called amphorae (NHER 4612, 14383 and 39259). Some of the amphorae found on excavations in Norfolk have been identified as imports from France, Spain, North Africa and the Eastern Mediterranean area. Other exotic goods were brought to these shores such as the burnt remains of a group of twenty-two Roman dates and a plum found in Colchester. The Romans also brought the onion, cucumber and garlic from central Asia and herbs such as coriander, dill, cumin and rosemary from the Mediterranean area. Archaeological excavations in Colchester revealed the remains of a Roman shop selling herb seeds, which had been burned down during Boudica’s rebellion in AD 60. The seeds found included those of dill, coriander, aniseed, celery and poppy. Many of the plants introduced, such as the onion, cabbage, celery, turnip, walnut, sweet chestnut and grape vine are still grown here today nearly 2000 years later. Grains of grape pollen have been discovered in waterlogged pits during excavations at the small Roman town of Scole (NHER 1007) on the Norfolk-Suffolk border. The excavations also revealed that there was once a brewery on the site. The seeds of grape, blackberry, sloe, bullace, elderberry, cress, wild radish, fat hen and orache have been found at Scole (NHER 1007) as have grains of spelt, bread wheat, barley and oats. Bread, porridge and gruel made from cereal grains such as these would have formed a large part of the everyday diet. Excavated bones and shells from Roman sites in Norfolk show that a wide variety of animals were on the menu. The bones found at Brancaster fort (NHER 1001) on the north Norfolk coast include cattle, sheep, goat, pig, red and roe deer, hare and whale. The bird bones were from chicken, goose, duck, woodcock and pigeon. The fort further along the coast at Caister-on-Sea (NHER 8675) also had badger, swan, coot, crane and golden plover. 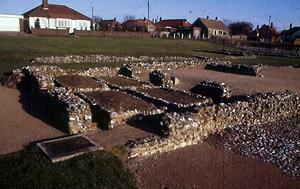 The Romans had a passion for seafood and the inhabitants of the fort at Caister-on-Sea (NHER 8675) were no exception. Excavations on the site revealed the shells of oyster, mussel, scallop, cockle, tellin, winkle, purple and whelk. The excavators stopped counting the oyster shells when they reached 10,000. 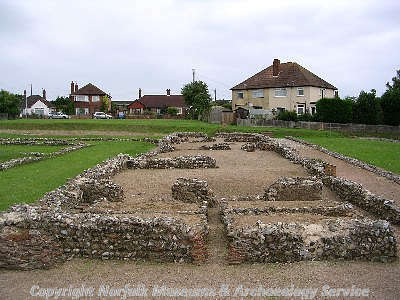 Oyster shells can be found mixed in with the mortar of the Roman town walls at Caistor St Edmund (NHER 9786) and have been found on many other Roman sites in the county (NHER 1267, 22927 and 25763). Fish would have been an important part of their diet and perch scales were found in a Roman well at Scole (NHER 1007). Here are several Roman recipes to try. They have been adapted from the Roman cookery book of Apicius. Lightly fry the mushrooms in oil. Add some red wine to the pan and cook gently till the mushrooms are done and the wine is reduced. Season with salt and coriander. Clean the mussels, discarding any that are open. Place all the ingredients in a large saucepan and cover with a lid. Heat rapidly, shaking the pan from time to time, for about 5 minutes until all the mussels are open. Slice carrots, cook in a little water, then drain. Add olive oil and cumin to taste and reheat with carrots. Serve. Moisten the flour with wine and add aniseed and cumin. Rub in the lard and grated cheese and mix in the egg. Shape the mixture into 12 small cakes and place on a bay leave on each cake. Bake in the oven at gas mark 6, 400°F (220°C) for about 25 to 30 minutes. Many of Apicius’ recipes show that the Romans loved spicy food and were very fond of sweet-sour sauces, containing ingredients such as pepper, lovage, mint, bay leaf, cumin, honey, vinegar and liquamen or garum. Liquamen or garum was a fermented fish sauce that was so popular it was mass-produced at several centres in the Mediterranean region and shipped all around the empire. There were many recipes but the main ingredients were sprats, anchovies and mackerel. The fish were placed in an open jar with vinegar, herbs and wine and then covered with salt. 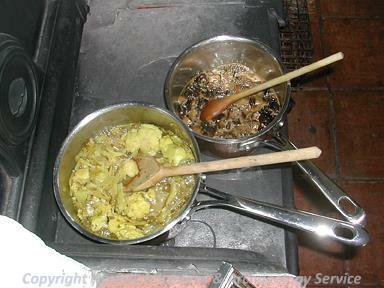 The mixture was left in the sun to ferment and dissolve into a thick sauce. It took two to three months before it was ready for use in the case of small fish and up to 18 months for large fish. Anchovy essence is the nearest modern equivalent.